In this Thrall Build Guide, we provide an overview of his strengths, abilities and talents. In this Raynor Build Guide, we provide an overview of his strengths, abilities and talents. In this Brightwing Build Guide, we provide an overview of her strengths, abilities, talents and matchups. In this guide we provide a list of helpful tips and tricks to help you draft effectively. The Hero Draft in Hero League is a key component of the game and is very much part of every match. Playing to the Draft and ensuring your composition works against the opponents is fundamental to not only regularly winning in Hero League but at the very least giving yourself the best opportunity to win. Every single day I’m amazed at how few people know how to draft and instead they enter into Hero League wanting to only play their favorite Hero or put no thought into how a specific Hero works against another. Failing to consider the enemy team, how they’ve put their team together and what strengths and weaknesses they have will make an enormous difference to your match. So much so that it’s more than possible to give yourself poor odds before you’ve even started. Fundamental to any draft is understanding Heroes and their roles. This includes their skills, talents and ultimate abilities. Not knowing typical Hero builds or how they function will put you at a massive disadvantage when trying to counterpick. For example, if E.T.C is chosen it’s highly likely his team will build around his Mosh Pit Ultimate ability. Expect to see AOE attacks from Heroes such as Jaina or Kael’thas. Countering this, with stuns or Polymorph is a must. Without knowing what Heroes have what skills (and talents) it makes life difficult on how you build going into a match. Often I’ll play Lunara because I can carry well with her, but most teams follow this up with a Zeratul or Kael’thas, trying to take advantage of my low health pool. Fortunately Lunara has Greater Spell Shield (or with enough practice a means of avoiding both these Heroes comfortably). This toing and froing of pick and counterpick, through the understanding of Hero roles is critical. Building on the above, you should always pick to counter an enemy Hero. This is only possible if you fully understand who you’re fighting against and what they bring to a team. Unfortunately learning how to counter a Hero is directly linked to your game experience but there are some obvious signs and I’ll do my best to provide you with some examples. In a match I played recently, the enemy team first picked Muradin. It’s a safe pick that you really can’t do anything against. Muradin is one of the few Heroes who has survivability, a reliable escape and an invaluable stun. My team mate then chose Nova, a Hero that - arguably - is a pretty terrible choice for a first selection. Not only can your enemy team then build around you, but it also heavily dictates how the rest of your team builds themselves. Unsurprisingly the enemy team then chose Tassadar: the fact he can regularly reveal Nova put us at an immediate disadvantage. Interestingly they also selected Zeratul, a Hero that can often make light work of Nova due to his speed and mobility. 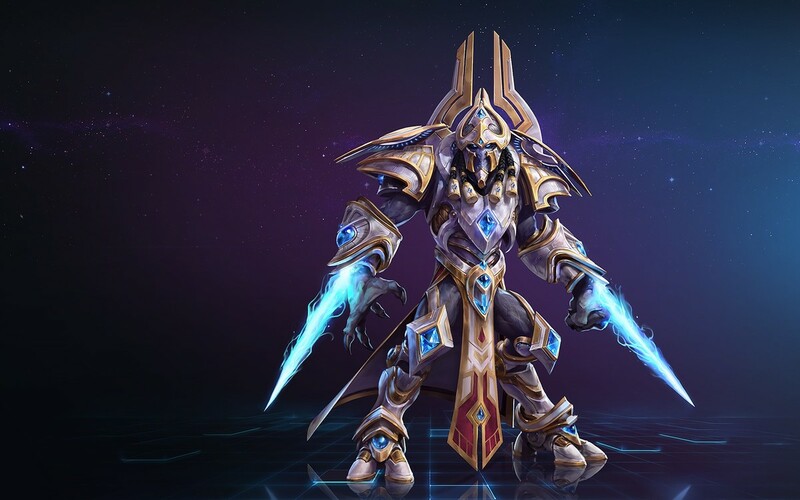 If the enemy team first picked Artanis, what would you choose to counter him? This put our team, at this point, at an advantage. They only had two spots remaining for two damage dealers, or an additional support (Tyrande and Tassadar often pair up). If they didn’t take a support, we’d know that heavy damage and group pressure would stretch Tassadar incredibly thin. If they did, they’d be low on damage output if we handled Zeratul. The first thing we agreed on was to take Lunara, based on her ability to constantly apply constant poison pressure and reveal stealthed players through her talents. Tassadar couldn’t possibly protect his team against such damage over time, while even Tyrande would struggle. Following our selection of Johanna, Lunara and Nova (they had Muradin, Zeratul and Tassadar) they picked up Tyrande and Jaina. Our final picks countered both of those fairly well (Lunara is already strong versus Jaina). Taking Thrall and Rehgar, we were in a very good position. Not only did Rehgar provide a full heal if we needed it, but a slow (great versus Tyrande and Jaina) as well as high control from Thrall. Unsurprisingly we demolished the enemy team, partly as a result of mistakes they made (Jaina was regularly out of position) but the fact that we continually harrassed Zeratul. We ensured our Nova remained hidden until Zeratul appeared, at which point we’d focus him quickly. Once a fight was 4 v 5, we simply applied constant pressure to Tyrande in the knowledge that once she was down the group would scatter. I’m not in any way suggesting this is a perfect draft and Nova was a very poor pick (Lunara is also risky unless skilled with her, especially against Zeratul). Despite that, it had some solid counters to their setup which worked very well. With bans having made it into Hero League, it’s incredibly important to predict enemy selections. It’s also very possible to play clever with banning certain Heroes. A typical example is, at this moment in time, players always banning Li Ming and Illidan. However, if your team is smart and first pick, you can ban another Hero (any, really) forcing the enemy team to choose Li Ming or Illidan. Once they have, you can scoop up the one which wasn’t banned. As long as the player who is picking first is comfortable on either Hero, it’s a win win. During the second ban stage and this is often the most critical, it becomes somewhat easier to know what to ban for maximum value. In a recent match we had a Kael’thas who wanted to take Pyroblast as the enemy had secured Li Ming, E.T.C and Thrall. It’s a nightmarish combo for anyone and Kael’thas was a solid choice. Considering he stated early about Pyroblast, we banned Kharazim first (to remove the possibility of Divine Palm). For the second ban, we knew they’d want Rehgar, Brightwing or Lt. Morales (Brightwing due to Pixie Dust reducing ability damage by 50% when talented). With that in mind we banned Brightwing and sure enough, they picked up Lt. Morales and banned Rehgar. At this point the only remaining support was Malfurion but this worked exceptionally well for us - not only could he root E.T.C and Thrall, but also Lt. Morales. Better still, they had no defence against Pyroblast. Our final picks, just to counter E.T.C and his Mosh Pit we picked up Muradin (stun) Sylvanas (Mind Control) Valla (stun ultimate). Combined with Gravity Lapse from Kael’thas, we were very well covered for dealing with both E.T.C and Thrall. Unsurprisingly you can’t always predict what an enemy will pick (certainly in a PUG environment you do see some bizarre selections) but forcing enemy teams into a corner, by cleverly using bans, is important. Knowing what you have, versus them, and what their team might need to counter you is a challenging. It comes from experience but also understanding our previous point: counters and Hero roles. There shouldn’t be any surprise here, but you should always focus Meta Heroes. They should make up the majority of your lineup. No exceptions. There’s a reason why people always choose certain Heroes and it’s because they’re outrageously strong. Don’t pick Nazeebo when you can have Lunara. Don’t take Azmodan when you can have Sylvanas. Don’t take Arthas when you can have Dehaka. For every Hero in the game, regardless of their role, their will always be an equivalent that’s better. Yes it’s rubbish if your favorite Hero isn’t in the Meta, but you have to play to the game and its best Heroes. I’m not suggesting you can’t win with Heroes that aren’t on trend, but it doesn’t help you gain an edge over your enemy. Building on the above, if you’re going into Hero League with the intention of only playing one Hero (Nova players, I’m talking to you) - just don’t. Do everyone a favor and stick to Quick Match. Not only does an insistence on playing a specific Hero force an unfavourable draft, but it can often result in your entire composition being skewed. It can, in a worst case scenario, result in you standing little or no chance of success before you’ve even began. Even more so when more than one player insists on choosing their “favorite”. Only recently I had a match where two players on my team wouldn’t play anything other than Nova and Azmodan. Both Heroes are poor in the Meta and resulted in low team damage and presence. Our only options were to take one DPS, one Tank and one Healer. Even then, we had so little damage and were counterpicked so hard at draft we lost miserably. Hero League is intended for teams to work together to form a team based on their opponents choices, not to staunchly insist on playing their favorite “just because”. Fundamentally this means you might have to play a Hero or role that isn’t your favorite. To read the latest guides, news, and features you can visit our Heroes of the Storm Game Page. In this Orphea Build Guide, we provide an overview of her strengths, abilities, talents and matchups. In this Mal'ganis Build Guide, we provide an overview of his strengths, abilities, talents and matchups.